Compared to other mixed drinks, gin and diet tonic is a sensible option if you're watching your caloric intake. Still, alcoholic beverages are best consumed in moderation, especially if you're watching your weight. The calories are "empty," containing no nutrients, but they can still cause weight gain, if you consume them on top of your usual weight-maintenance diet. Tracking the alcoholic beverages you imbibe on a calorie counter is a good tip so not to go over your weekly limit. 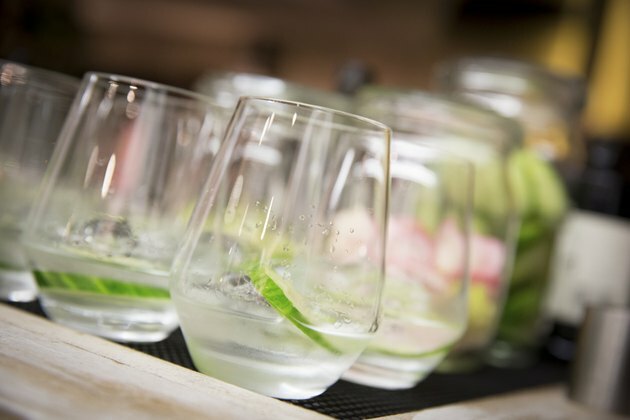 Gin contains 64 calories per ounce, or about 97 calories per 1.5-ounce shot. The diet tonic does not contribute any extra calories, as diet sodas are generally calorie free. Even adding a squirt of lemon or lime juice will not add a significant number of calories. Because gin contains the same number of calories as other distilled spirits such as vodka, light rum and tequila, mixing any of these with a diet beverage will yield an identical calorie count.